The Transbay Program is a national model for transit-oriented development. It will bring 11 transportation systems under a single roof, and create a pedestrian and bike friendly community where residents and workers have convenient access to rapid and safe public transit, shopping, open space, and other neighborhood amenities. These features will allow residents to live closer to work, reducing commute times and increasing productivity. The Program will create an estimated 125,000 jobs, directly, indirectly and induced, including approximately 8,300 construction and 27,000 permanent jobs. It will open up a significant number of employment opportunities for people that live in San Francisco and along the Peninsula corridor. The Downtown Rail Extension (DTX) will help remove thousands of daily-commute vehicles from the Peninsula, translating to $360 million in travel time savings, more than $120 million in avoided vehicle operation and maintenance costs, and more than $20 million in benefits from improved safety. 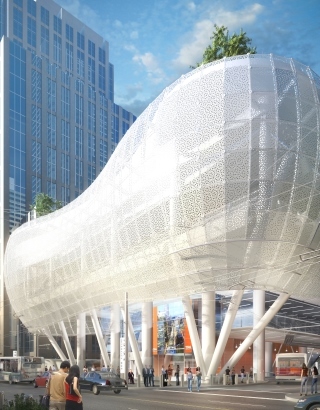 Regionally, construction of the Transit Center and buildout of the surrounding Transbay neighborhood will generate more than $87 billion in Gross Regional Product and $52 billion in personal income through 2030. The Transbay Program and related amenities are expected to result in about $3.9 billion in premium value for existing and new commercial and residential properties within an about ¾ mile zone around the Transit Center. For a detailed overview of the increases in property values that will be generated for real estate surrounding the new Transit Center, please click here. For a comprehensive report, please click here.